Photographs © Stephen Selby, Csaba Grózer, Stefan Domoney 2004. Wishing you all a happy and prosperous year 2005! In 2005, we plan to hold the second Asian Traditional Archery Festival, following the success of the one held in Hong Kong in 2003. The planned title of the 2005 event is "The Asian Traditional Archery and Horseback Martial Arts Festival, Korea 2005", and it is to be held in the City of Sokcho, South Korea. I am sure that you recall my research into the Khotan bow ― the half bow that had lain buried together with a mummy in the Taklamakan Desert from about 350AD until I obtained it in 2003. On the basis of the photographs, X-rays and measurements that I supplied, the bow has been reconstructed by Csaba Grózer. In this letter, I shall present his reproduction and interview Csaba about it. The bow drawn to 30"
Csaba has carefully followed the dimensions of the original bow; however, overall construction is a little more robust than the original to take account of the fact that he was exporting it to Hong Kong, and not the Taklamakan Desert. Just as in the original, the siyahs and grip are sheathed in bone. And like the original, he has used five strips of horn to make the belly. The bow weighs 933 grammes in the hand and the draw weight is 50 pounds at 28". The maximum draw length is 32", consistent with the length of the original arrows that were found with the bow. It shoots very fast and is extremely stable. There is hardly any chance of this bow twisting or coming unstrung. 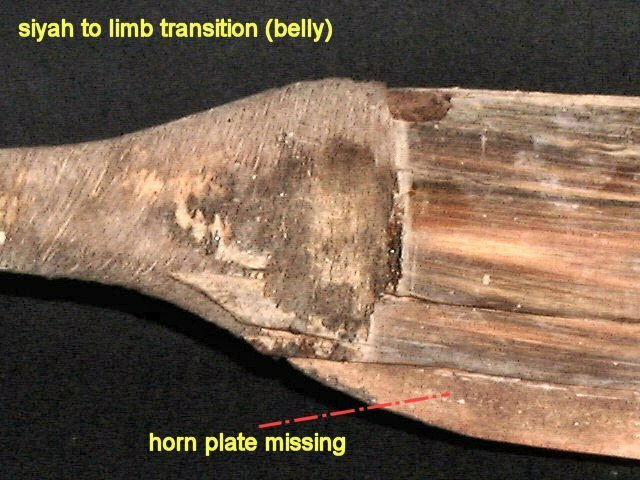 The only distinctive feature of its shooting properties (say, as compared with modern Turkish and Chinese style horn bows that I have collected) is a complete lack of hand shock. It releases with a 'thunk' sound and there is no vibration after the shot at all. S: When you first saw the description of this bow, what your feelings about the design? C: When I first saw a picture of the Khotan bow, my first thought was that it couldn't have been used as a 'real bow' designed for shooting, but a bow for decoration. S.What were your experiences in making the modern reproduction? What were the difficulties? C. First we made the wooden core to have a curved (concave) diameter, but it straightened a bit during drying. We made the incurvation of the bow with the help of a jig (we send a picture of it). We glued the horn on the limbs of the bow in 5 stripss. These strips moved from each other during gluing so it was quite difficult. When putting on the sinew, I put more on the edges than the middle in order to make it more curved (concave). Despite this after putting on the sinew, the bow lost some of its concavity. S. After completing the bow, what is your feeling about the shooting properties? C. The bow shoots faster than I expected. I thought the limbs would be held back because of the air resistance. S. Do you see any advantages about this design? For example, why do you think that the limbs were so exceptionally broad? 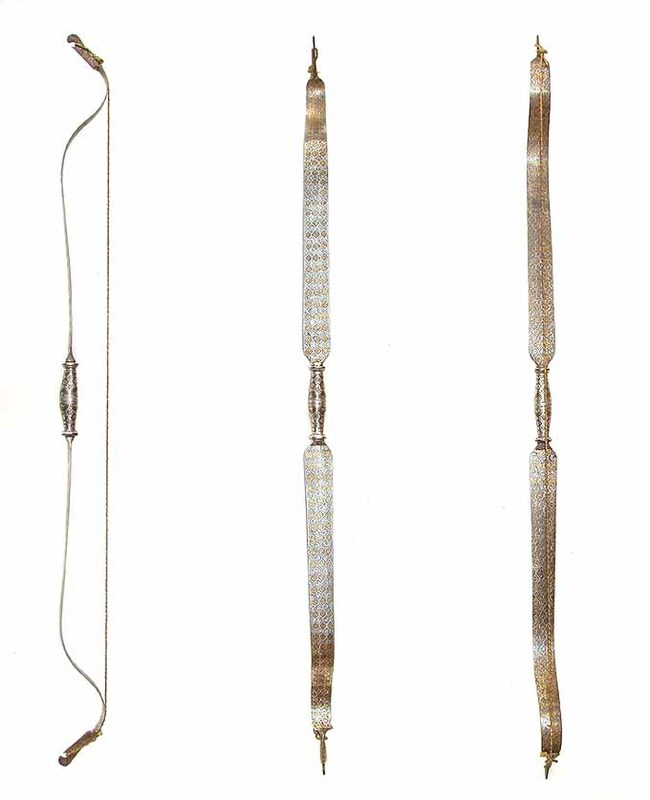 C. One would think that the limbs are so wide because this way they can't twist; but interestingly, just before setting the limbs were as mis-aligned as other narrow bows. The bow isn't faster at all than any other narrower bows, and cannot be drawn smoother despite the fact that I expected this. To tell you the truth, I don't really see the sense of this wide-limbed bow. It didn't show any surprising characteristics from any point of view. S. If readers wished to commission you to make further copies based on the Khotan bow in horn and sinew, would you agree? C. I'm not planning to make another Khotan bow because it was very complicated. S. Do you think that this design could be made in artificial materials such as fiberglass? C. Probably it could be done from modern artificial materials as well; but definitely not from fiberglass, because it would break. I've done some experimenting on this. 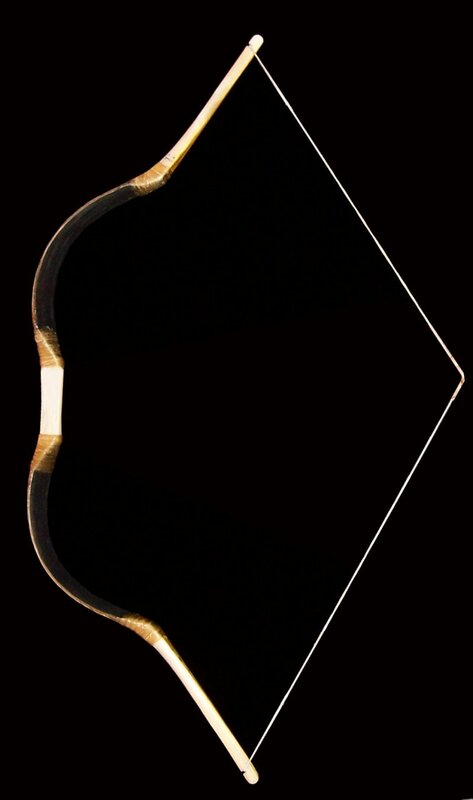 It is more difficult to make a good-working wide-limbed concave bow from artificial materials than from horn. Modern materials are too rigid for bending. As you can see from our email conversation, neither building the Khotan bow or shooting it has offered any real insights into the reason for such an extraordinary design. I am looking forward to reading the views of ATARN members in the coming weeks. 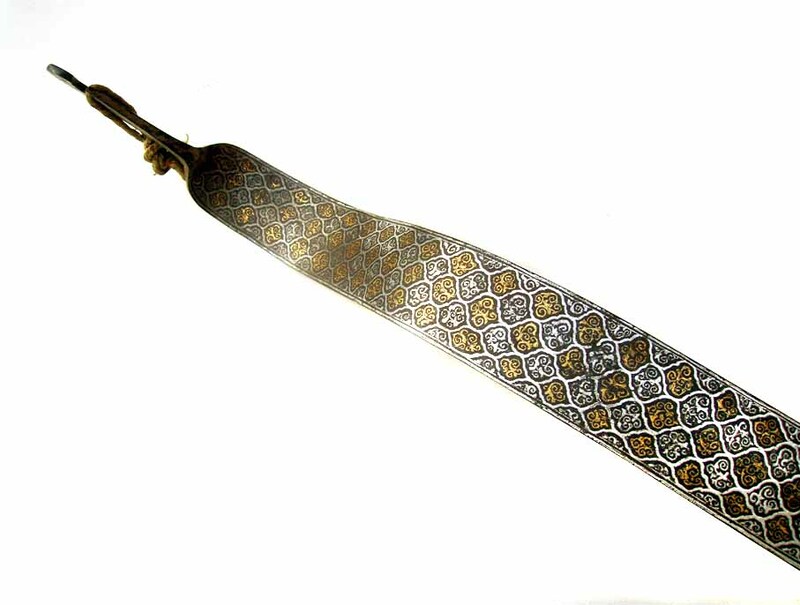 In the eighteenth to nineteenth centuries, craftsmen in Persia and then in Mughal India started to make bows out of steel. Such bows were relatively heavy in the hand; but they were durable and withstood adverse climate conditions well. They were therefore excellently suited for the climatic variations found in the Northern part of India. The material for the bow was a form of steel called 'wootz'. The metal was forged as layers of hard wootz steel and softer steel so that layers were formed through the process of cold-welding as the layers were forged together. 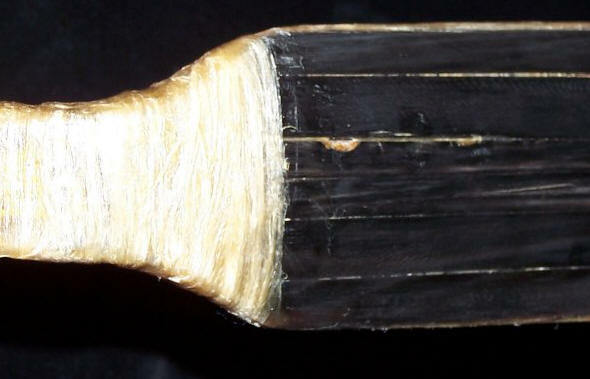 While Japanese sword blades were forged with a similar process, the Japanese blades used two grades of hard steel, while wootz blades used alternating layers of hard and soft material producing a composite material. 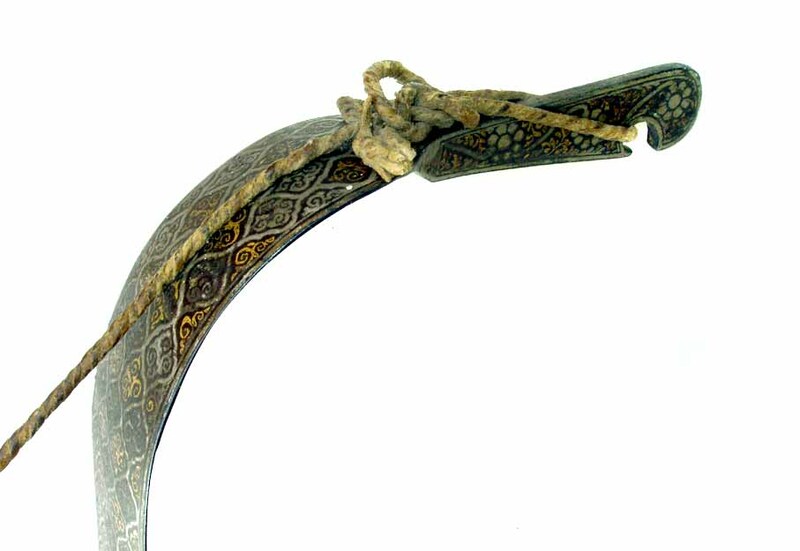 One city in India was particularly associated with the production of steel bows: Hyderabad. 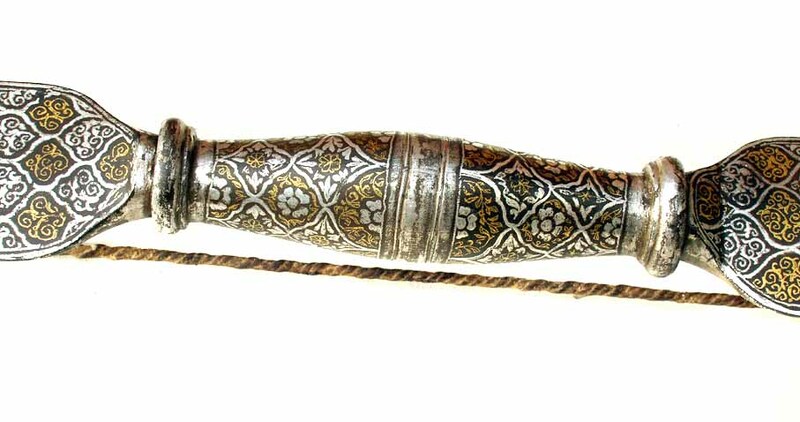 In the city of Bidari, north of Hyderabad, steel bows and other weapons were made with a particular form of decoration called 'bidri'. Once the bow had been formed, the steel surface was treated with copper sulfate, which turned the surface black. 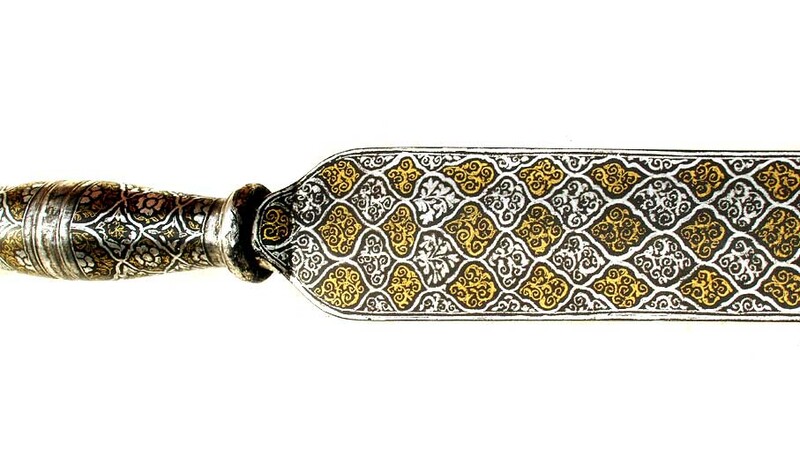 It was then incised with a sharp blade in patterns, and silver and gold were hammered into the incised channels. 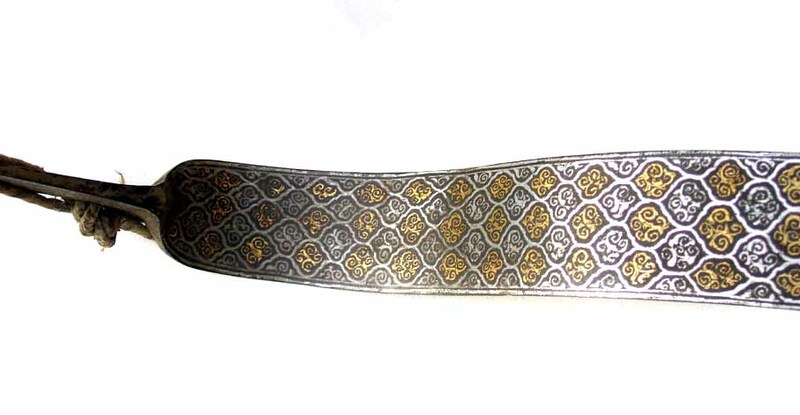 I have recently obtained a fine example of a Bidri steel bow from Stefan Domoney, who sells genuine antique weapons from his Internet website at www.ashokaarts.com. Stefan has kindly authorised me to reproduce his photographs of the bow for ATARN Members. Many thanks to Stefan for letting us enjoy his outstanding photography. This bow will be put on display at the Hong Kong Museum of Coastal Defence later this year.